Walking down Marylebone high street at 6.45 in the afternoon, and it feels like every passer-by is craning their necks to get a look at me. Have I got lipstick on my teeth? Is my hair poking out at funny angles? No, the glances are of admiration, and then I realise that it’s because of my dress. Wearing a shocking fuschia dress I stand out from the monochrome street and monochrome outfits of passers by, and it feels great. If I were in a film, I’d swish my hair, flash a dazzling smile, all thanks to upping the technicolour spectrum of my wardrobe. It’s curious – the world seems nonplussed by what I’m wearing. Is my choice of clothing linked with my personality? These people don’t know me but by wearing this colour I feel liberated, I could be anyone I want to be. After experimenting with various brightly coloured dresses, it became apparent that regardless of the colour of your outfit (within reason), staples and the silhouette that suits you will be true no matter the colour of the garment. With broad shoulders and a long torso, I know that fit and flare shaped dresses are the most flattering for my shape, and whether it’s black, lime green or dazzling pink, I know that it will work. The cut and shape over the colour affect how comfortable I feel in what I’m wearing. Yes, black hides a multitude of sins but it also hides personality. Wearing colour is something we shouldn’t be afraid of, we should remove the urge to blend in, step out of the shadows and wear something that makes you stand out from the crowd. 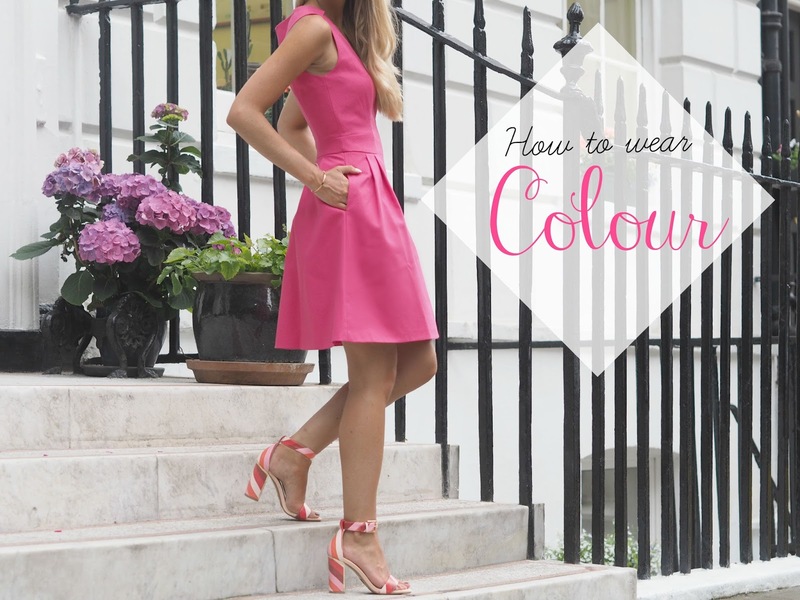 I attended a Colour Masterclass with Dove to celebrate their 100 Colours campaign, and here are the top tips that I picked up for How To Wear Colour. Colour is the New Black. 1. Don’t be afraid to pair prints, like these Dorothy Perkins heels, with bright colours. If you can find a hue from your dress to pick out in your accessories, then the bolder the better. 2. Nervous? Mix brights with neutrals, such as a colourful skirt with a stark white shirt for a more wearable feel. 3. Don’t let the colour wear you. Some people can get away with wearing all the colours of the rainbow at once and look fabulous, but for me, the colour would dominate. If you don’t feel confident in a colour, don’t wear it. 4. Start with accessories. Accessories bring an outfit together but they’re perfect add-ons if you want to inject some colour into your outfit. Try out colourful accessories to introduce colour into your look but without spending a fortune! 5. Hold up coloured tops near your face. In the bright store lights, recognise how one colour lights up your eyes and brightens your complexions, and others leave you feeling flat. 6. Confidence is key. You don’t want to worry about things like deodorant marks, and Dove’s Invisible Dry antiperspirant is proven to leave no white marks on 100 different colours, so you can wear your favourite colour with confidence! 7. Forget the rules, colours can clash! Blue and green, pink and orange. Some of the most striking colour combinations can look fabulous, but you need the attitude to match! 8. Use colour to shock. Working in a coroprate environment? An instant conversation started could be bright red shoes or a fluorescent yellow handbag, helping you stand out in a sea of grey (think Elle Woods on the steps of Law School in Legally Blonde!). What are your top tips for colour confidence?